Towards the end of the first millennium and at the beginning of the second, pilgrimage gained increasing importance. The holy places of Christianity were Jerusalem, Rome and Santiago de Compostela, and the via Francigena became the central hub of the great ways of faith. In fact, many pilgrims coming along the way from the north to Rome would continue along the via Appia towards the ports of Puglia, where they would embark for the Holy Land. Conversely Italian pilgrims to Santiago followed this road to the north, perhaps to Luni to embark for the French ports, or continue to the Mont Cenis and then take the Via Tolosana to Spain. Pilgrimage soon became a mass phenomenon, increasing the profile of the via Francigena, which became a channel of communication fundamental to achieving the cultural unity that characterized Europe in the Middle Ages. It is mainly due to travel diaries, and in particular the records of an illustrious pilgrim Sigeric the Serious, that we can reconstruct the ancient route of the via Francigena. In 990, after being ordained Archbishop of Canterbury by Pope John XV, the abbot returned home and on two handwritten pages noted the 80 “mansions” where he rested. The diary of Sigeric is still considered the most authoritative source for the direction of the route, often it is called “the via Francigena according to Sigeric” to define it as a more “philological” path. The increasing use of the via Francigena as a trade route led to the unprecedented development of many towns along the way. The way became an essential route to take the goods from the east (silk, spices) to the markets of northern Europe and trade them, usually in the Champagne fairs, for cloth from Flanders and Brabant. 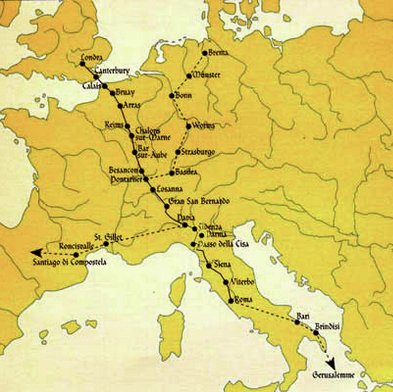 In the thirteenth century trade grew to such an extent that several alternative routes to the via Francigena were developed, and it therefore, lost its unique character and broke into numerous different routes linking the north and Rome.So much so that the name changed to the via Romea, no longer defining the origin, but now the destination. In addition, the growing importance of Florence and the centres of the Arno Valley diverted the paths further east, until the Bologna-Florence road relegated the Cisa Pass to a purely local role, signalling the end of the ancient route. • I am indebted to the official website of the Vie Francigene for much of the factual information.